Kampala Minister Beti Kamya wants City Contract Committee operations change. 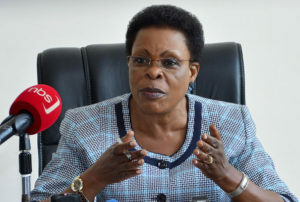 KAMPALA–As Kampala Minister Beti Kamya is seeking to change the composition of the City Contracts Committee, political leaders want to be appointed as members. Making changes on the composition of the contracts committee requires amending the KCCA Act 2010. “We need to make some changes in the management and leadership of the committee,” Kamya said. Currently, the city contracts committee comprises technical people headed by KCCA legal director. According to the KCCA Act, the City Contracts Committee members are nominated by the city executive director and approved by the Secretary to the Treasury. The committee members are appointed basing on their technical competence and skills. In executing its work, the city contracts committee seeks the services of the City legal advisor. Other leaders like the deputy Lord Mayor, Sarah Kanyike, are of the view that the elected leaders should also be appointed. Kanyike says the appointment of elected leaders will help eliminate loopholes in the award of contracts. She faulted the contracts committee for awarding contracts to only international firms, leaving out the local ones. “Some local contractors have the ability to do good work but they are not considered. This is why we want some elected leaders to sit on the contracts committee to push for this,” Kanyike explained. Her boss, Erias Lukwago is skeptical about the motive behind, arguing that Kamya and her group are trying hoodwink the public. “The main reason why she wants to amend KCCA Act is to make the minister the political head of the capital city, instead of the Lord Mayor,” he noted. He asked Kamya to bring the proposed amended Act before the council for discussion. “If it is in good faith, let her bring the good ideas to us,” Lukwago said. Since she was appointed city minister last year, Kamya and Lukwago have never agreed on anything, with the latter accusing the minister of wanting to usurp his political powers.